Why poles with properly designed straps are an essential part of the equipment for Nordic Pole Walking. Nordic Poles have straps to ensure you achieve the health benefits and fitness level you deserve. There’s no question; you will receive more benefit when you use proper Nordic straps with your Nordic Poles. For best results, you need the proper equipment. Hiking poles, trekking or walking sticks just don’t achieve the same results. Nordic Pole Walking or Nordic Poling or Nordic Walking initiated from the summer training regime of cross-country skiers, and they used poles with straps. Over the past 25 years, the Nordic Walking technique has evolved. The poles and straps were modified to ensure people achieve the health benefits and fitness level they expected by using poles with straps for forward propulsion and exercise. Proper Nordic Pole Walking requires that the poles have straps. There are sound reasons for this. Nordic Pole Walking is a sport that increases your upper body and core strength. The straps allow you to become one with the pole. They give you stability so you can properly control your swing when you’re moving quickly. Only when the UPPER arm can swing in front and BEHIND the side line of the body can 90% of the muscles engage!!!! The straps allow you to on continue with a downward pressure on the poles (via the straps). This keeps the boots stuck to the ground while your upper arm and lower arm swings behind the side line of the body. To engage your muscles through the full arc of your swing, you need to let go of the pole to do this! Therefore, straps are essential. If you watch the tip of the poles with a person who is HOLDING the handle and swinging the entire arm…the pole tip lifts off the ground JUST AS the arm reaches the mid-side line. Therefore the back muscles never get a chance to engage, get stronger, and straighten the posture. Straps also enable you to release your grip as you propel yourself forward. The propelling motion is essential in order to increase your stride, and see cardiovascular improvement. The straps also save you from having to grip the handle tightly. The last thing you want is to suffer from repetitive movement syndrome – and that happens a lot to people who use poles with no straps. They have no choice but to grip the handles tightly for long periods of time. Gripping hard is an impossible and painful task for those who are healthy let alone those with arthritis. 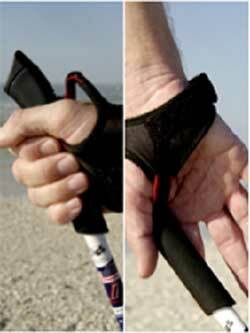 Nordic Pole Walking is now a lifestyle sport and to do it properly you need Nordic Poles with straps. Many people confuse “Nordic Poles” with “trekking, hiking, urban or ski” poles but the poles, the techniques and health benefits are different compared to using nordic poles for Nordic Walking. For maximum health benefits nordic walk 3-4 times a week with Nordic Poles. Straps increase stability and enable you to be far more flexible. Poles that have no straps are simply walking sticks. These sticks are for people who need the extra balance when walking slowly. Or they could be used in hiking up a mountain. They are not sporting poles – they are walking sticks. You can hike or trek with Nordic Walking poles, but you cannot Nordic Walk with strapless hiking or trekking poles.” The big different is in the outcome. What do you want to achieve? The key to a strap is that it fits like a glove and allows the pole to snap back into your hand accurately on each release! The perfect Nordic Release Technique each and every time! So make sure you purchase poles with holes or cradles in the straps. This will ensure that you have an effective workout. Nordic Walking Nova Scotia is operated by Bill and Esther VanGorder. 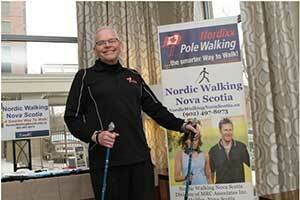 We offer Nordic Walking clinics and are the Atlantic distributor for industry-leader Nordixx Pole Walking Canada. Nordic Walking Nova Scotia is your Atlantic source for top quality, authentic, reasonably priced Nordic Walking poles and supplies. Our How to Nordic Walking clinics are designed for all adults. Family and children's classes are also offered in separate venues. These introductory events will train you to Nordic Walk properly for the best possible enjoyment and benefit. Our instructors are nationally certified to teach Nordic Walking. Copyright © 2016 Nordic Walking Nova Scotia. All Rights Reserved.